Last week in my post I told you about Settembre Lucchese from the locals’ point of view. Now it is my turn! The events calendar has been published and there are some interesting news, you can download it here Programma_Settembre_Lucchese_2016 or you can find it in several places in town as the Tourist information Office in Piazzale Verdi, at the Lucca info&guide point by the train station and several cafè, bars and stores. The Tradition: it is still fascinating after so many years and maybe it comes from the fact that it has never been modified: the night of September 13 with the Santa Croce Luminara. The candles or called lumini, the extremely long procession, the people standing in corners and squares quietly watching it. Everybody could and can take part, it does not matter if you are high class, a farmer, a young or a child, men and women. This is something it makes you a Lucchese: to have attended at least once in your life to the event. I like the devotional atmosphere, the preparation during the week of the frames around the windows for the candles and the crowd…the fireworks!! The food: the fall seasons brings the porcini mushrooms and the grape harvest but the must do for Settembre Lucchese is to eat the Frati, a sweet delicious street food. It is a fried doughnut, with sugar on top. You can smell it from miles…Hot and soft, made by the Nelli family from generation in Piazza San Michele and now in Piazza Napoleone. Frati means friars, why this name? The doughnut shape reminds the tonsure of the monks. 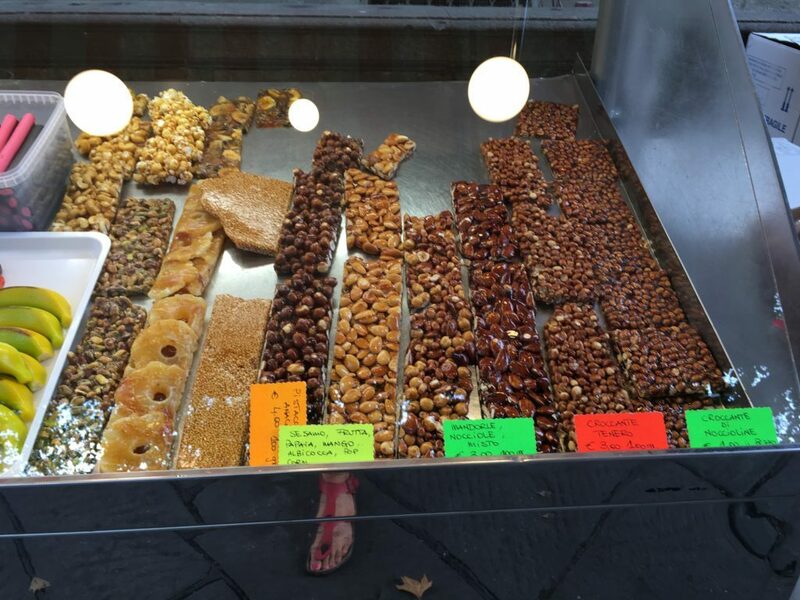 You can eat also the candies, nougat (croccante) and brigidini at the markets! Then do not miss the wine tasting under the loggia of Palazzo Pretorio (San Michele, every day) and the new Red Hot Chili Festival at the Real Collegio on Sept 10/11. The markets: in addition to the regular antique market (Sept 17/18), the arts & craft market (Sept 24/25), and the Big street market in Borgo Giannotti district outside the walls on Sept 14,21 and 29: a very typical market with lot of stuff for the house, shouting vendors, food, clothes and yes…some junk 😉 ! For the smart ladies do not miss the lovely Fashion in Flair exhibition at Villa Bottini on Sept 23/24/25: art, design and fashion made in Italy. The culture: conferences, meetings and exhibitions: Magnum on the Set at the Lu.cca Contemporary Art Museum, Emigration and the First World War above Porta San Pietro, photography at the Fondazione Banca del Monte in Piazza San Martino and in Piazza San Michele and in Corte dell’Angelo. Guided tours at the newly restored bastions and dungeons on Sept 9 at 4.30 and or 10,17 and 24 Sept. The sport: from the traditional Lucca by night to the Selfie Run or the non competitive 5k at 5.30 am on Sept 9th with a delicious breakfast at the arrival! Then volley and football tournaments, dance, gymnastic and martial arts and have you ever heard of the Cheese Shape Throw/Launch?? The amusement/fun park or as we call it in italian the Luna Park, the giostre: fancy a ride on the roller coaster? the Horror House? In the Piazzale Don Franco Baroni, outside the walls this year there are more then 200 games!! This is definitely a must for the lucchese kids! I spent so many afternoons there on the bumper cars!! This is something totally new but it sounds fun and cool Adventure Walls, a role play game under the Lucca Walls: 120 players divided in teams will have to find their way out solving riddles and tricks on 17th September.